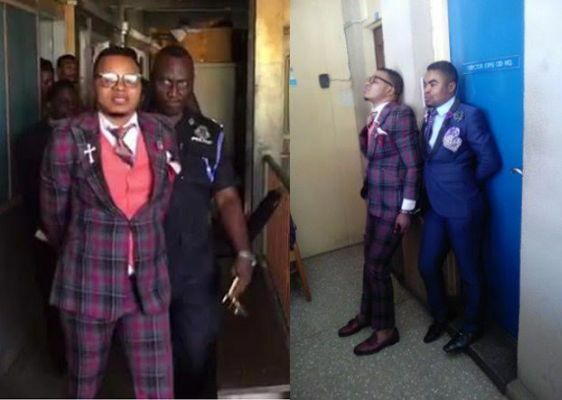 Controversial founder of the International God's Way Church, Bishop Daniel Obinim was escorted in handcuffs and transferred to the Accra Police Headquarters after he reported himself to Tema Regional police station earlier today. The 'Angel of God' had responded to invitation following complaints made to the police after he publicly flogged two teenage members of his church for alleged fornication and attempted abortion. The police had given him 24 hour ultimatum to honour their invitation or they will be forced to take action against him. A video of the man of God flogging the two with a belt went viral on social media recently, drawing widespread criticism but the Bishop defended the action insisting they deserved it for engaging in fornication and attempting an abortion. However, there is a twist...according to Ghana media, the controversial Preacher is also being interrogated over a GH¢11.6 million fraud case. The Criminal Investigation Department (CID) PRO, ASP Joseph Darkwa, said a complainant came to the Tema Police some few weeks ago to report that he gave an amount of GH¢780,000 to Okomfo Gyapataof Mampong Nkwanta near Koforidua in the Eastern Region to do a spiritualritual to bless the money. "According to the complainant,after some time, he realised that the Okomfo was not able to help him neither was he able to give him back his money, so he came to Bishop Obinim to report the matter so the Bishop would help him retrieve the money and do the rituals to bless the money for him," he said. 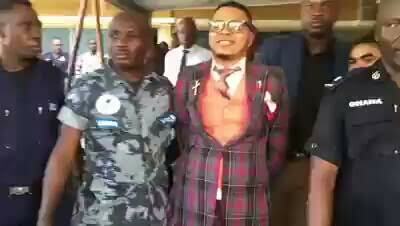 ASPDarkwa said it was based on that that Bishop Obinim asked him to bring the rest of the gold money which amounted to GH¢11.6 million belonging to the family. The complaint told the police since he gave the money to the Bishop, he has not been able to do what he was expected to do neither was he given his money. The complainantsaid he gave the money to OkomfoGyapata on November 28, 2015, but the money he gave to Bishop Obinim was in June this year. The CID PRO told Joy News' Dzifa Bampoh on Newsnite that the complainant has not lodged a complaint against Okomfo Gyapata as yet but if it becomes necessary that they have to involve him they would do so. "We have just commerce investigation into this issue, when we finish we will hand him over to Domestic Violence Victims Support Unit (DOVVSU) to investigate the domestic violence issue," ASP Darkwa said. 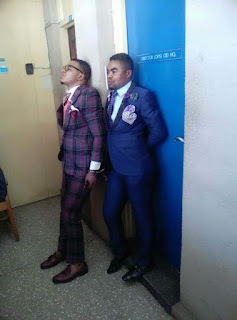 The congression waiting for him to lead service at the Tema Community 9 branch were disappointed as the junior pastors throng the police station and they registered their disappointment upon seeing him handcuffed into a police car to be transferred to Accra, Joy News reports.